We prospectively reviewed 44 patients (27 men) with a mean age of 49.6 ± 18.4 years that received PEMF therapy due to tibial shaft delayed union or nonunion. In all cases, fracture gap was less than 1 cm and infection or soft tissue defects were absent. Fracture union was confirmed in 34 cases (77.3%). No relationship was found between union rate and age (p = 0.819), fracture side (left or right) (p = 0.734), fracture type (simple or comminuted, open or closed) (p = 0.111), smoking (p = 0.245), diabetes (p = 0.68) and initial treatment method applied (plates, nail, plaster of paris) (p = 0.395). The time of treatment onset didn’t affect the incidence of fracture healing (p = 0.841). Although statistical significance was not demonstrated, longer treatment duration showed a trend of increased probability of union (p = 0.081). 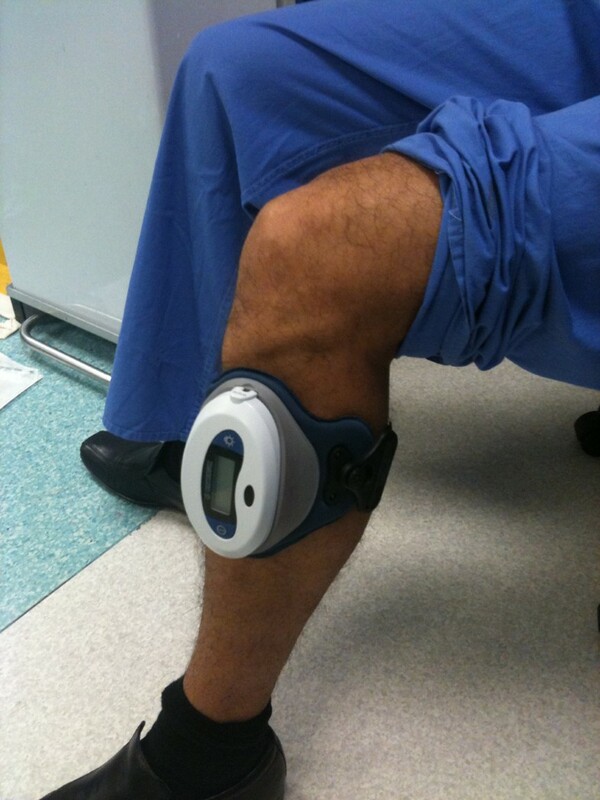 We prospectively evaluated 52 consecutive patients with tibial shaft delayed union (and nonunion who were treated with a battery-powered PEMF device (Physio-Stim, Orthofix) (Figure1). Eight patients were excluded from the study due to lost to follow-up (5 patients), non-attendance the outpatient appointments (2 patients) and severe vascular dementia (1 patient) leaving 44 patients for further evaluation. The medical records of these patients were assessed with the approval of the hospital's institutional review board. In accordance with the manufacturer guidelines, the system was applied 3 hours per day, for a maximum period of 36 weeks. Further weight-bearing restrictions or fracture immobilization were not applied. The fracture gap in all cases was less than 1 cm and the bone defect less than one-half the width of the bone to be treated. Patients with infective nonunion or severe soft-tissue defect were not deemed candidates for the PEMF stimulation regime. The device was prescribed by the treating orthopaedic surgeon during the outpatient clinic reviews. The prescription was then reviewed by the Clinical Director of the department and was supplied by the senior plaster technician, who was in direct communication with the manufacturer. Patients were monthly followed-up using serial anteroposterior and lateral X-Rays until fracture union occurred or further operation took place. The plain radiographs were reviewed in order to assess the initial fracture type and progress of fracture healing. The absence of either adequate fracture callus in a minimum period of 9 months or progression toward healing for 3 consecutive months was defined as nonunion. Delayed union was assumed when no union was achieved at 20–26 weeks postoperatively. The fracture considered to be healed when radiographic evidence of bridging callus formation was seen in at least three cortexes. Statistical analysis was performed with the use of SPSS 17. Variables were tested using normality plots and the Kolmogorov-Smirnov test (with 0.200 considered as the lower boundary of true significance). Non-parametric numerical variables are presented as median, with range between round brackets and were compared with the Mann–Whitney U test. Normally distributed numerical data are presented as mean with standard deviation (SD is symbolized with ±) in brackets and were compared using the student’s t-test. The Chi-square test was used to study categorical variables. Correlation between scale variables was analyzed with Spearman’s rho. Kaplan-Meier survivorship curve was used for analysis of the probability of fracture union. Statistical significance was assumed at p < 0.05. There were 17 women and 27 men with a mean age of 49.6 ± 18.4 years. The left limb was affected in 25 patients and the right in 19 patients. Fifteen out of the 44 patients were smokers. Diabetes was present in 5 patients. Fracture union was achieved in 34 out of 44 cases (77.3%) (Figures 2 & 3). The 10 nonunions were observed in 2 simple closed fractures (1 smoker), in 3 comminuted closed fractures (one smoker), in 2 Grade I open fractures (one smoker), in 2 Grade IIIA open fractures (one smoker) and in one Grade IIIB open fracture (one diabetic). No statistical significant relationship was found between union rate and age (t-test, p = 0.819), smoking status (chi-square test, p = 0.245), diabetes (chi-square test, p = 0.681), (fracture side (left or right) (chi-square test, p = 0.734), fracture type (simple or comminuted, open or closed) (chi-square test, p = 0.111) and initial treatment method applied (p = 0.395, chi-square test). Anteroposterior (a) and lateral radiographs (b) of a distal tibial nonunion 10 months after fracture. PEMF stimulation of fracture site led to fracture union 5 months thereafter as shown in anteroposterior ( c) and lateral ( d) tibial views. 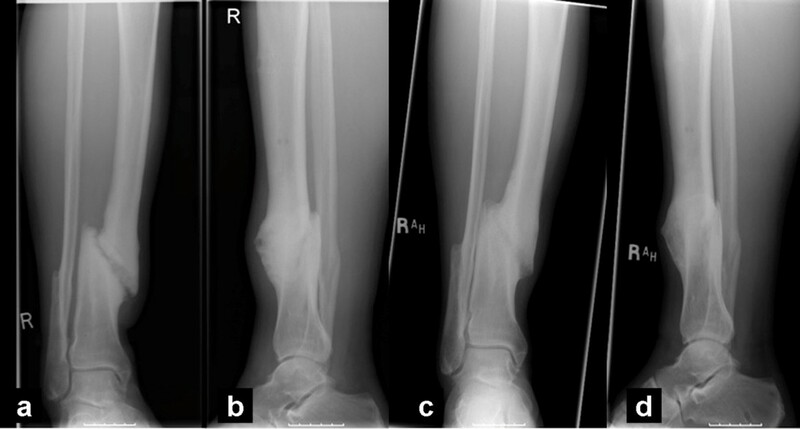 Anteroposterior (a) and lateral radiographs (b) of an open Grade I distal tibial fracture. 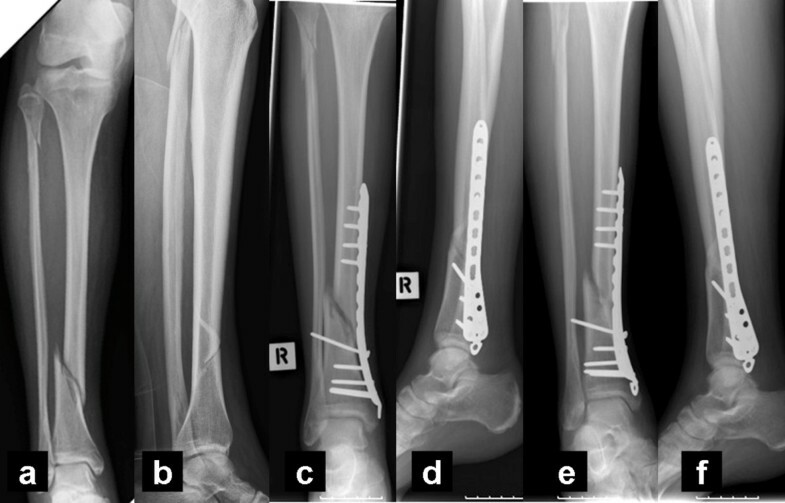 Six months after surgery, anteroposterior ( c) and lateral tibial radiographs ( d) showed slow progression of healing. Seven months after PEMF introduction, anteroposterior ( e) and lateral tibial radiographs ( f) showed bridging callus in 3 out of 4 cortexes (medial, anterior and posterior). 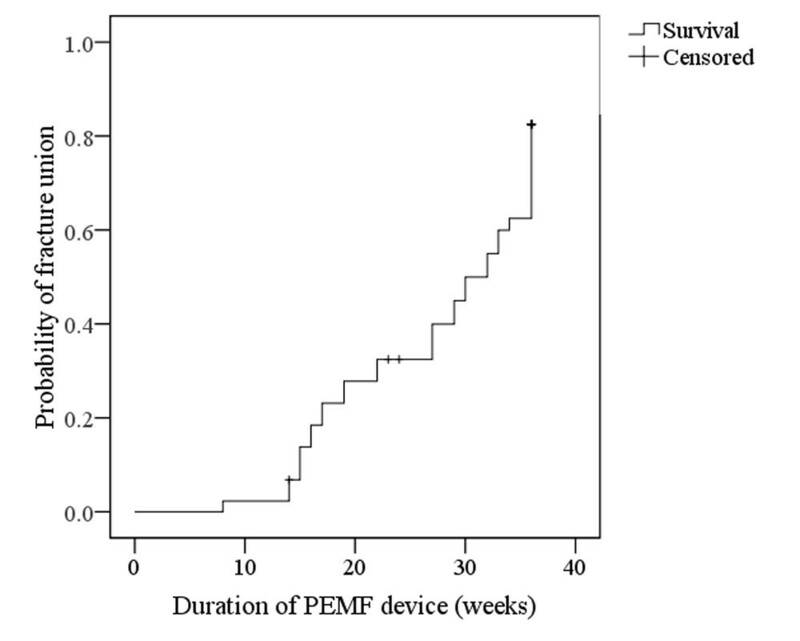 The median time interval between the latest fracture management and the introduction of PEMF was 24.5 weeks (21–57 weeks). The median duration of PEMF application was 29.5 weeks (8–36 weeks). No correlation was observed between these two time variables (p = 0.348, r = 0.145, spearman rho test). Similarly, no association was found between the above time variables and the overall union rate (p = 0.081 and p = 0.841, respectively, Mann Whitney U test). The probability of fracture union in relation to duration of PEMF is presented in Figure4. Although statistical significance was not demonstrated, the curve shows a trend of increased probability of healing after longer application of the device. Kaplan-Meier recurrence curve of patients treated with PEMF. Line represents probability of fracture union in relation to the duration of PEMF treatment (weeks). Crosses represent censored cases where follow-up was stopped because union was deemed unlikely with conservative management. It seems that the introduction of electromagnetic fields at the fracture site can stimulate the bone in a way similar to mechanical loading . However, there is still ongoing debate regarding the mechanism of action of PEMF at cellular and molecular level. PEMF have been advocated to stimulate the synthesis of extracellular matrix proteins and exert a direct effect on the production of proteins that regulate gene transcription . Electromagnetic fields may also affect several membrane receptors including PTH, insulin, IGF-2, LDL and calcitonin receptors . Moreover, when osteoblasts are stimulated by PEMF, they secrete several growth factors such as bone morphogenic proteins 2 and 4 and TGF-beta [6, 11]. The principle underlying the application of PEMF is that of inductive coupling [6, 11]. The electric current is produced by a coil, driven by an external field generator. The outcome is a secondary electrical field produced in the bone . The secondary field is dependent on the characteristics of the applied magnetic field and tissue properties. Magnetic fields varying from 0.1 to 20 G are usually applied in order to produce electrical fields in bone, ranging from 1 to 100 mV/cm . Contra-indications to the use of PEMF include segmental bone loss, infected nonunions, synovial pseudarthrosis and poor stability of fracture site . As opposed to other methods of non-invasive augmentation of fracture healing, such as low-intensity pulsed ultrasound (LIPUS), PEMF have not been assessed thoroughly in robust studies of high methodological quality . Despite the relative scarcity of well-organized randomized controlled trials, many in vivo and in vitro studies highlight the method’s potential usefulness . Particularly and in terms of clinical practice, the efficacy quoted in treating tibial delayed unions or nonunions has been reported to range between 45% and 87% [12–20] (Table1). Bassett et al  reported a case series of 127 nonunited or delayed united tibial fractures that treated with PEMF. Patients were recruited over a 5-year period after an average of 2.4 failed surgical interventions prior to PEMF application. PEMF were applied for a mean period of 5.2 months and the patients were advised to remain non-weight bearing. The overall healing rate was 87%. Sharrard et al  found a 86.7% successful outcome in 53 tibial nonunions that treated with a PEMF system. The authors advocated that infection, a screw in the fracture gap, a gap of more than 5 mm and inadequate immobilization were responsible for treatment failure. Gupta et al  studied prospectively 45 tibial atrophic nonunions without infection, presence of implants or fracture gap more than 1 cm. Healing was achieved in 85% of cases during a 4-month period. Poor compliance was considered responsible for the three persistent nonunions.